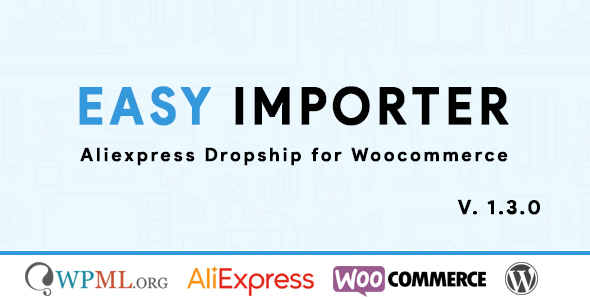 from aliExpress.com to your woocommerce shop just by one click ! And make money with aliexpress.com affiliate program! . The plugin is helpful to create the site with specific products and use affiliate URLs. – The ability to get the shipping information for Aliexpress products with Setup of the selected countries: ship-to. – The ability to import multilingual translations of product such as attributes, titles, and descriptions. – Possibility to Add the forbidden words for hidden any word (it checks product title and description and the name of the method of shipping). – Fulfill Orders Automatically (have your orders shipped directly to your customers in just a few clicks). – Filter Products with ePacket. – Easy Importer works as plugin on any wordpress install. – Add product name to all images in product contents. – Compatible with any wordPress woocommerce ready theme. – Counting Products views and affiliate link clicks. – Search Aliexpress for the product by Product ID. – Search product by keyword and AliExpress category. – Support aliexpress api error message. – Split search results into pages to simplify data review. – Two mode product display (Grid and List). – Participiate in the Alixpress Affiliate program by adding your API key. – Find links to Aliexpress product and seller pages on the WooCommerce Orders page in the WordPress backend. – Use the Price rules to set own rules to add your markup/margin to product price. – Possibility to display regular and sale prices of the product. – Auto-update system to check product price/stock-availability. – Auto Update Product info. – Bulk posting of found products from the search result page into WooCommerce. – Quick-edit product feature for each found item. – Ability to delete links and images from the product description while the posting (automatically). – Set own product statuses on posting and out-of-stock event. – Save free space on your server to limit count loaded images for products by using import product images limit.